South Africa is a big, beautiful country, promising the experience of a lifetime. 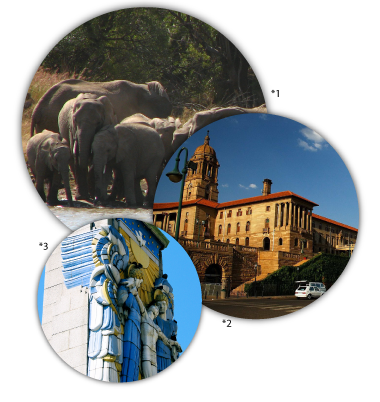 South Africa offers hospitable people, , glorious weather, spectacular scenery, a wealth of culture, wildlife and wilderness, and world-class hotels and restaurants. "Once considered the secret haven of upscale travellers, South Africa has moved into the mainstream," Kathleen H Dodge wrote in the Physicians Money Digest. "Few spots on earth offer vacationers options that combine wine tasting with wildlife, five-star comfort with game viewing in the African bush. The only complaint - visitors wish they could stay longer." The animals alone are reason to visit. One of the world's first wildlife conservation areas was South Africa's Kruger Park, more than a century old. Today it is just one part of a broad conservation area reaching across national borders into neighbouring Mozambique and Zimbabwe. An hour's drive from such urban jungles as Pretoria and Johannesburg, is Pilanesberg (bordering Sun City) and there you can see lions, elephants, buffaloes, rhinos and hundreds more species in the raw African bush. For birders, South Africa offers over 850 recorded species. There are many remote places to escape to in South Africa's varied landscape, from the massive Drakensberg range of mountains, which run like a spine down the length the country, to the rock formations of the Cedarberg mountains in the west, the Northern Cape's haunting Richtersveld area, and the vast plains of the Karoo desert. Then there are golden beaches, some of the world's best surf, ecosystems found nowhere else in the world, an opportunity to experience African culture first-hand - and one of the least expensive holiday destinations you'll find. South African food celebrates their rich heritage and natural bounty of seafood, meat, game and plants. And their wine has been earning rave reviews internationally for 300 years. Cultural experiences include modern art galleries, rock art centres, state-of-the-art museums, remote cultural villages, city jazz clubs and open-air festivals. For adrenaline junkies, there's world-class rock climbing, surfing, diving, hiking, horseback safaris, mountain biking, river rafting - and a host of other adventures supported by dedicated operators. Their cities are an exciting mix of first- and third-world influences. From happening Cape Town - one of the most beautiful cities in the world - to busy, bustling Johannesburg, each has its own unique attractions. South Africa offers a secure environment to make this Congress an unforgettable experience.